You can connect to the SponsoredTweets.com website using your Twitter account. The cost per tweet depends on the number of followers you have and can be adjusted in your Dashboard. 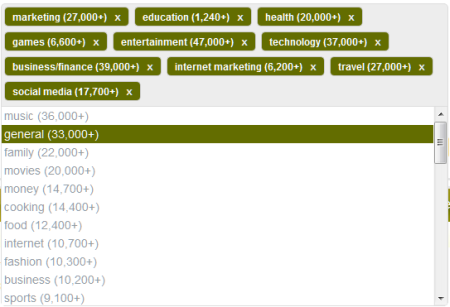 For example an account with 2500 followers may have a recommended cost per tweet of aprox. $2.50, an account with 7500 followers may have a recommended cost per tweet of aprox. $8.00 and so on. The cost per tweet will increase proportionally with the number of your Twitter followers. Type a category name in your dashboard or select categories from the existing popular Twitter categories, as in the image below. When you get an ad opportunity you can accept it or reject it, based on your interest. You will be provided with instructions to write your Tweet. Other pre-approved ads may show as available on your Dashboard. These are usually low payments of a few cents per tweets. Advertisers will send you a link and text to promote and you can write your own tweet based on the provided instructions. 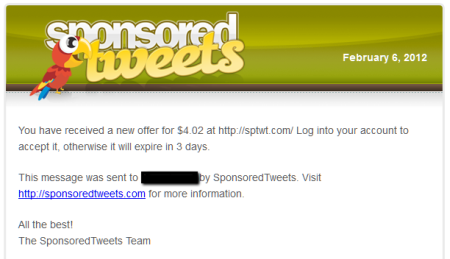 Then the advertiser will approve your tweet and Sponsored Tweets will send that tweet in your Twitter timeline. You have to reach a number of clicks to get paid. All tweets include a sponsor disclosure by using a hashtag like #Ad #Sponsored #Ads etc. If you don’t have enough clicks you will receive a notification to re-tweet. If needed, advertisers may also suggest you more details to include in your tweets. Click the banner below to signup for Sponsored Tweets now!